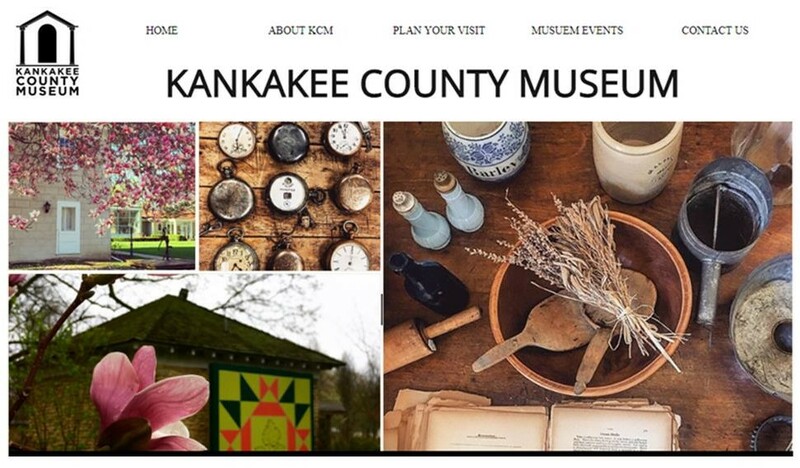 October | 2014 | Let's Talk History! 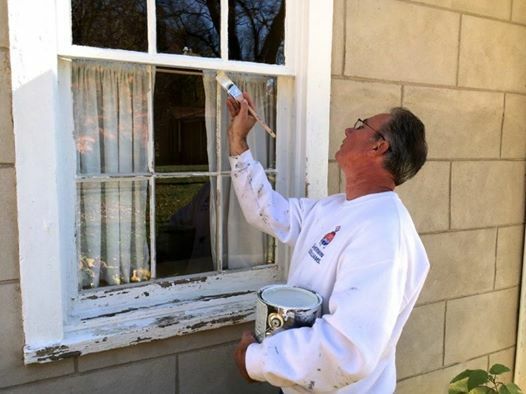 Chris Nicklas is a local high school student with a passion for history. This summer, we gave him access to one of our uniforms and all the accompanying information. He then traced the uniform’s history through the past and wrote a report on his findings. A big thank you to Chris for his time and energy this summer! The artifact box that contained the uniform had a card that stated that Frank Garner wore the uniform. The card also stated that Mrs. J. Frank Garner had donated the uniform in 1950. Genealogy research located J. Frank Garner, who was born in New York in 1860. According to The Biennial Report of the Adjutant General of Illinois to the Governor and Commander-in-Chief 1891 and 1892 Springfield, Illinois: H.W. Bokker, State Printer and Binder. 1893., J. Frank Garner was in the National Guard of Illinois. On June 7, 1886 he was a Private. On June 6, 1889 he was a Sergeant. On June 10, 1889 he re-enlisted. On March 20, 1892 he was a First Lieutenant. He served with the 3rd Infantry Regiment, L Company. There is no record of him serving in any wars. The Illinois State Marriage Index indicates that J. Frank Garner married Mina (Minnie) S. Beckman on June 13, 1898 in Kankakee. (Found in Volume 00C 00006567). According to the 1900-1940 censuses, J. Frank Garner lived in Kankakee with his wife Minnie. In 1924, he was a Post Master of Kankakee Lodge 389 according to the Kankakee Freemason Website. On December 20 1949, J. Frank Garner died in Kankakee. Minnie died within the year on December 18, 1950. J. Frank Garner is buried in Mound Grove Cemetery, Kankakee, Illinois in Section 19, Lot 79. (Death Certificate #0050503). The uniform was not a standard-issue uniform. 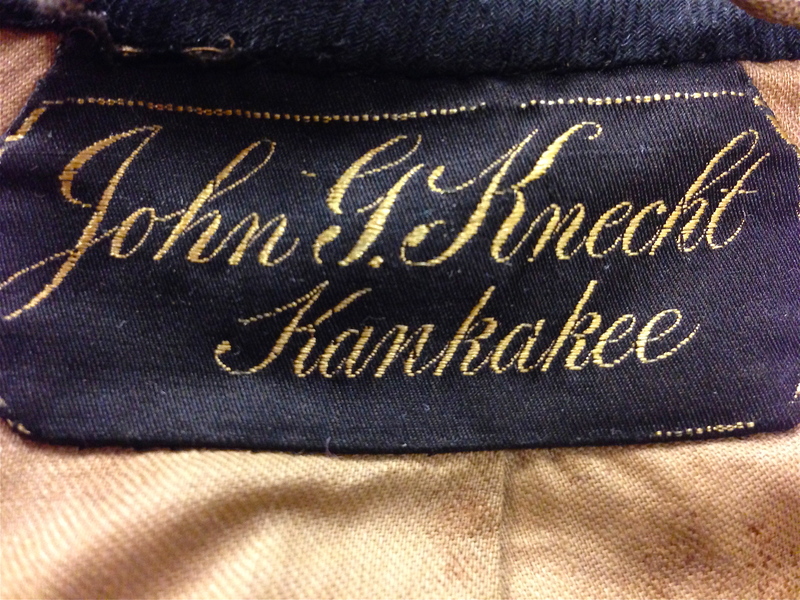 On the tag of the uniform it reads “John G Knecht Kankakee”. Mr. Knecht was a tailor who emigrated from Germany. John Knecht had a large store in Kankakee. The store initially opened in 1857 and burned down in February 1869. He was able to rebuild on the southeast corner of Court Street and East Avenue. It appears the uniform was made by a tailor from John G. Knecht & Co. (1867 Kankakee Illinois Ledger). The uniform was triple-breasted. For the time period it was not a common style, except for musicians. The uniform had shoulder straps with the number 3 flanked by a bar on each side. The bar represents the rank of First Lieutenant, while the number 3 represents the regiment number. The front of the uniform has three rows of nine identical buttons each. The cuffs have three buttons each on top of a white trim. (This trim pattern indicates the Infantry branch.) The back of the uniform also has buttons. The collar of the uniform has one button on each side. Also, each shoulder knot has one button near the collar. 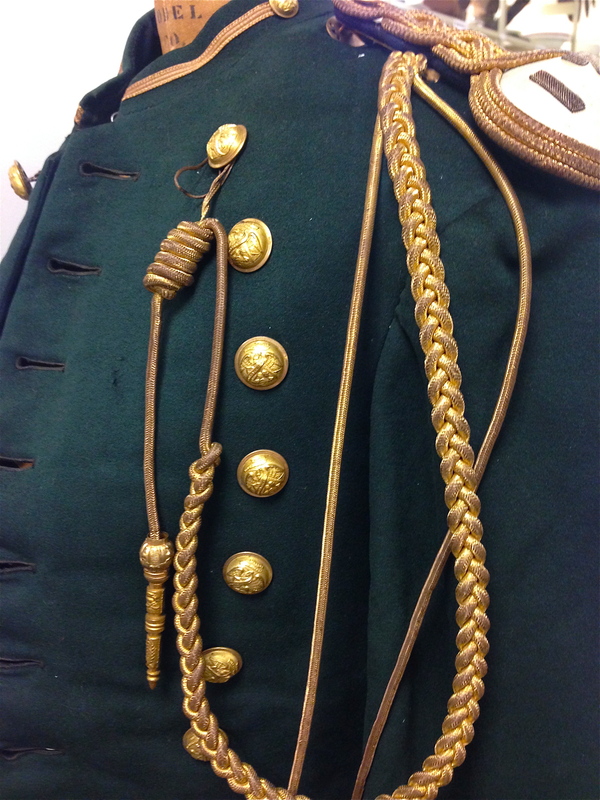 The pattern of the buttons on the collar is different from the buttons on the rest of the uniform. 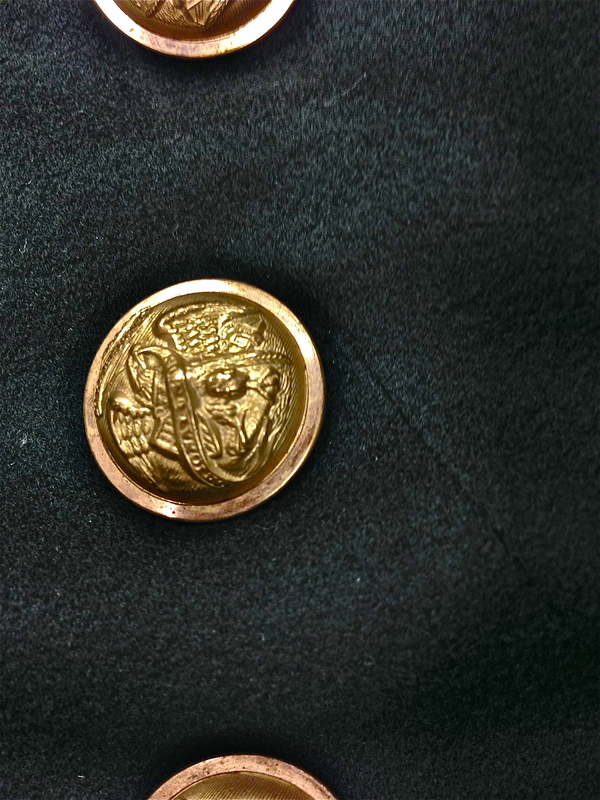 All of the buttons had eagles on them, however, the eagle on the collar had a different orientation and the shield was offset to the left. The helmet is an 1881 pattern helmet but has the number 4 on the front eagle plate. The number on the helmet indicates the regiment number, but it conflicts with the number 3 on the shoulder knot and information that he served with the 3rd Infantry. Throughout all of my research, the only photo of a similar uniform is in a photo of Charles Livingston from Kankakee, who was also in the Illinois National Guard. It is photograph number P1346 in the Kankakee County Museum Photographic Collection. The only difference is a chevron on the sleeve. The portrait of Livingston was taken in 1896, close to the time that J. Frank Garner served (1886-1892).